Join Collins Library for an informal series of reading hours and drop-in making sessions on Tuesday evenings 5:00-6:00pm in the Archives & Special Collections and the Makerspace! Passionate about a social justice issue? Come browse our zine collection to discover new ideas and perspectives on an issue that matters to you. Need some time to reflect and relax? Explore our zine collection to find materials that are mindful, inspiring, and sometimes even funny. Bring in an in-progress project and make! 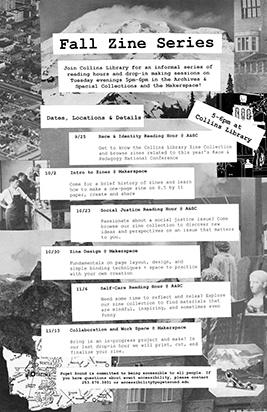 In our last drop-in hour we will print, cut, and finalize your zine.